Is it possible to abstract a formal mechanism originating schisms and governing the size evolution of social conversations? In this work we propose a constructive solution to this problem: an abstract model of a generic N-party turn-taking conversation. The model develops from simple yet realistic assumptions derived from experimental evidence, abstracts from conversation content and semantics while including topological information, and is driven by stochastic dynamics. We find that a single mechanism, namely the dynamics of conversational party's individual fitness as related to conversation size, controls the development of the self-organized schisming phenomenon. Potential generalizations of the model - including individual traits and preferences, memory effects and more elaborated conversational topologies - may find important applications also in other fields of research, where dynamically-interacting and networked agents play a fundamental role. Multi-party conversations are prime manifestations of collective socio-cultural interactions. The Santa Fe Institute's Complex Systems Summer School 2009 was an excellent occasion for the authors to investigate this statement from an alternative and formal vantage point. During all meals, groups of up to 20 people comfortably clustered in quasi-circular ensembles and entered into lively turn-taking conversations. An occasional observer could easily discern that table conversations were not stable. Not all participants seated around a specific table took part at all times in a table-wide conversation. Usually, participants took part in conversations that involved only a subset of the people seated around that table. As a result, each table had multiple, separate sub-conversations going on at the same time. Moreover, people taking part in one of these parallel chats usually did not remain involved in the same sub-conversation indefinitely, but tended to leave their original sub-conversation and join another, possibly neighboring one going on at their same table. Remarkably, all of this happened independently of the very topics of conversation - that indeed fluctuated spatially and temporally. Was this set of behaviors accidental, or was there, on the contrary, any general underlying mechanism driving the group size evolution of conversations? This question has been addressed in social sciences from several perspectives. The general issue of pointing out the sociological factors that determine the group size of a conversation dates back to the seminal works of Simmel Simmel (1902). The splitting up of a single conversation into two or more sub-conversations, referred to as schism Egbert (1997); Schegloff (1995); Parker (1984); Sacks et al. (1974); Goodwin (1987); Goffman (1963); Goodwin (1984), was investigated by Goffmann in a qualitative, context-sensitive interpretative approach Goffman (1963), and by Sacks and collaborators in the context of discourse analysis Sacks et al. (1974). Several social features and effects of schisming were also addressed, including schism-induced turns Egbert (1997), multi-focused gatherings Goffman (1963) and co-occurrence of turn-taking systems Sacks et al. (1974); Goodwin (1984). Specific behaviors were documented by concrete experiments, such as video tape recordings Egbert (1997); Goodwin (1987), everyday experience Goffman (1963), or hypothesizing and reasoning methodology Simmel (1902). Significantly less work addressed the analysis of conversations and schisming processes from an abstract, context-free point of view. Such an approach was probably difficult to pursue in earlier times, as most data were empiric and therefore context-related. However, in recent years it has been possible to circumvent these restrictions thanks to the social simulation framework Axelrod (1997); Axelrod (2006b); Bandini et al. (2009); Byrne (1998); Miller & Page (2007); Axelrod (2006a). This was developed to improve the understanding of and to evaluate strategies, explanatory and predictive schemes of the behavior of social systems whenever - for e.g. practical or ethical reasons - gathering direct observations was impossible. Particularly, the well-established agent-based model (ABM) paradigm Bonabeau (2002); Bandini et al. (2009); Miller & Page (2007) has proven fruitful to simulate complex collective phenomena in several domains Axelrod (1997); Byrne (1998); Schweitzer (2003); Miller & Page (2007); Axelrod (2006a). Works on multi-party interactions were pursued in the context of artificial intelligence, addressing specific challenges such as e.g. human-robot interaction Bono et al. (2003) or pattern recognition Aoki et al. (2006); interaction structure in meetings, among which e.g. co-present meetings in smart meeting rooms for archival and assistive purposes Stiefekhagen et al. (2002); Ishizaki & Kato (1998), and remote interaction Vertegaal et al. (2003); and in more general scenarios Miller & Page (2007); Schweitzer (2003). Closer to our interests, Galley et al. proposed a remarkable topic segmentation algorithm for multi-party speech, which is domain-independent but nonetheless content- and knowledge-sensitive Galley et al. (2003). To our knowledge, no work so far addressed turn-taking conversation dynamics from a purely-formal perspective, abstracting from both content and context. In this paper we introduce such an approach by describing the emergence of conversational schisming as a self-organized complex collective phenomenon. We present an abstract model, based on simple formal yet realistic rules and driven by stochastic dynamics, that predicts the time-evolving size of conversation groups. By embodying the rules and boundary conditions into an ABM, we analyze how schisming drives the development of conversations. Since our model is deliberately abstract and context-free, our conclusions are general and do not restrict to any particular class of turn-taking conversations. Furthermore, proposed generalizations of our model may find useful applications in other research areas, as well. The rest of the paper is organized as follows: in Section 2 we present the baseline conversational model, defining the basic agent rules. In Section 3 we implement such model and provide the results of several simulation runs; particularly, we distinguish between transient dynamics, like real-life conversations, from stationary dynamics, which is the (probably unrealistic) asymptotic limit of the dynamics which, nonetheless, can in some cases be solved analytically in a mean-field approximation. Finally, we provide a summary of conclusions, as well as a discussion on the possible model generalizations and further applications of the work. Homogeneous initial conditions. At the beginning, all parties (i.e. participants) participate in a unique conversation and are in the same state. The conversation starts with a random participant entitled to speak - she will be called the speaker - while all other participants are listeners. Other initial configurations can of course be imposed; however, the dynamics tends towards attractors whose basins of attraction are global (see Sec. 3): every initial condition will thus tend to the same steady state. Hence, for simplicity and without lack of generality, we adopt a homogeneous initial condition. Roundtable topology. The participants are arranged around an ideal roundtable (i.e. a one-dimensional torus with periodic boundary conditions): each participant can speak with any other participant, but she is in intimate (i.e. spatial) contact only with her two nearest neighbors - which define her own topological neighborhood. This time-invariant conversational topology reproduces realistic, spatially embedded conversations that tend to cluster in a circular-like geometry. Turn-taking dynamics. In a given conversation, only one person (the speaker) speaks at any given time before another (different) participant (a listener of the same group) is entitled to speak. Within a single conversation, several non-overlapping sub-conversations can nucleate. We assume for simplicity that the speakers of all sub-conversations are appointed concurrently and simultaneously (this synchronous updating rule can be relaxed, if needed). This rule introduces the turn-taking dynamics in the model. Abstraction from conversational content. We model the succession of speakers within any given (sub-)conversational group as a stochastic process. In principle, it is possible to use any kind of speaker-dependent or history-dependent probability distribution to determine the choice of the new speaker. However, in this work we wonder whether complex patterns in the schisming dynamics can still develop without resorting to additional and detailed individual information. This approach, consistent with the complexity paradigm Byrne (1998); Miller & Page (2007); Schweitzer (2003), is also coherent with content abstraction: any kind of emergent conversation pattern will eventually appear as consequence of the cooperative behavior mutuated by multi-party interaction, rather than of a mixture of poorly-defined mechanisms. The probability distributions adopted in the baseline model are uniform, i.e. speaker- and history-independent. Joining/leaving force balance. Participants in a specific conversation remain in the conversation as long as they feel actively involved in it up to their preferred degree; otherwise, they start to wish to leave the conversation. We model this lively behavior by assigning a degree of happiness to each participant of the conversation. Happiness hereby stands for e.g. attention span, patience, assertiveness, self-esteem, and more: it is the index of the willingness of a participant to remain in a given conversation. 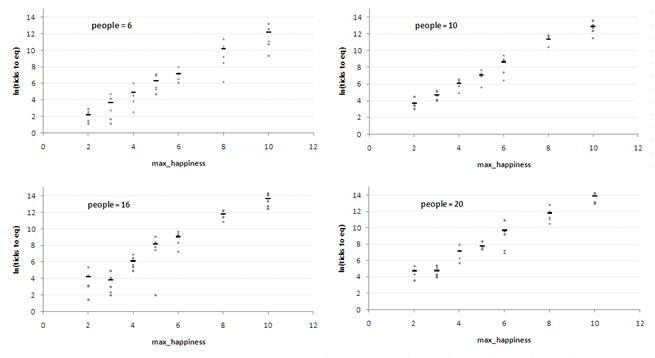 The baseline scenario has all participants initially involved in the same table-wide conversation and assigned with the maximum level of the happiness scale, which is set equal to that of anyone else - i.e. we optimistically assume a person is happy to take part in a conversation that is about to start. Again, different initial conditions would evolve towards the same stationary state, as we will see. The individual happiness level is then subjected to dynamic change. It is decreased by one unit for every conversation turn during which the participant is not a speaker, while it is reset back to the initial level when the person gets a new opportunity to speak. As soon as the happiness level drops to the minimum tolerated level (set to zero in the baseline model), the participant becomes latent, i.e. she feels excluded enough to watch out around her for opportunities to enter another or a new conversation. Our parties can thus be considered as finite-states automata with a set (ideally, a continuum) of states between the fully conversation-integrated state (i.e. the conversation's current speaker or newcomers - parties with maximal happiness) and the fully-excluded state (i.e. the latent - parties of minimal happiness). Corollaries: a) a speaker is always fully happy; b) a latent is necessarily a listener. Neighborhood-based schism dynamics. When a participant is latent, she will look to her topological neighbors to be eventually engaged in a different conversation. She will first check whether at least one of the neighbors is in turn latent: if this is the case, she will start a new conversation with her/them. This nucleation mechanism is the responsible for the onset of schisming in our model. She will instead join the ongoing conversation of either of her neighbors, if such conversation differs from hers. In both cases, her happiness level will reset to its maximum level. If none of these options are possible, the agent remains latent, waiting for someone to talk to her (and to return active in her previous conversation) or for someone to go latent, or for a different conversation to take place. The use of only local resources to escape from a stagnant conversation is what we define as the conversational principle of least effort. To verify whether our simple assumptions capture realistic features of real-life conversations, we implemented them and inspected the ensuing emergent behavior in an ABM using NetLogo4. The simulative investigations were complemented with analytical methods to gain further insights. The baseline model can be thought of as describing a homogenous group of people leisurely engaged in chat without selection biases due to accidental geometry, common interests, hierarchies or previous discourse patterns. Running the ABM with the homogeneous initial condition, it was found that the initial table-wide conversation group splits over time into several sub-convsersations of smaller group size. This is akin to a spatial symmetry-breaking phenomenon: the initial, spatially-homogeneous system (i.e. lacking boundaries) evolves into one with spatially-defined boundaries. This splitting process continues - despite temporary increases of the sizes of conversation groups - until the conversation groups cannot split any further, that is, until each sub-conversation reaches the absorbing state. Indeed, as long as there are more than 2 people in a (sub-)conversation, there exists always a non-null probability that one participant will not speak before her happiness level decreases to the minimum value, eventually driving her to leave the conversation; this is true independent of the total number of participants in the conversation and of their maximum happiness level. In the case of an even (odd) initial number N of agents, the asymptotic configuration presents N/2 sub-conversations of two agents (N/2 - 1 sub-conversations of 2 agents and a single sub-conversation of three agents). Equivalently said, the optimal though only asymptotic number of parties in a conversation, according to the baseline model, is predicted to be essentially 2 . The characteristic time until reaching this steady state (i.e. the characteristic amount of turn-taking time steps) depends on two factors, namely 1) the number of agents, and 2) the maximum happiness level. As expected, if the maximum happiness level is set to infinite, the steady state will never be reached, while if set to 1, it will be reached very soon. Numerical simulations indicate that this characteristic time scales exponentially with the overall maximum happiness level, and linearly with the number of agents (Figure 1). The relation between happiness level and number of agents is the single most important aspect of the model. As a matter of fact, maximum happiness level and number of agents have opposite effects, since their increase induces an increase and a decrease, respectively, of the probability of a single agent to be entitled as speaker. Anyway, it can be expected that the asymptotic state is hardly reached in real-life conversations, that typically develop within shorter timescales than the characteristic time to stationarity. Figure 1: Semi-logaritmic plots of the characteristic time needed to reach the steady state, for different settings of the maximum happiness level (data averaged over 5 simulation runs). The straight line denotes exponential fitting. In a mean-field treatment of the baseline model, we will assume that the probability pi of a participant i in a conversation to be entitled to speak by the present speaker at time t is: 1) independent of previous conversation history, and 2) constant in time. In general, pi = pi(N, i) where N is the number of participants, and the specific dependence of pi on each participant characterizes individuality, both intrinsic (e.g. psychological factors) or extrinsic (e.g. conversation geometry). Let Fi(t) be the happiness level of participant i at time t ; for what said before, Fi(t) is semipositive definite. Accordingly, for normalization reasons we conclude that Fi* = MAXi +1 - 1/pi is the stable fixed point of each participant. Now, a participant becomes latent when Fi = 0 . In order for a participant to be active in the steady state, we must have Fi* > 0 . This translates into MAXi > 1/pi - 1 which is a restriction in the waiting time (i.e. patience) of agent i . Note that depending on pi , each agent will have a different critical patience. As an example, in our baseline model we suppose that every agent has the same probability of being a speaker. Imposing probability normalization, we have pi = 1/N, ∀i = 1,..., N . In this condition an active steady state is achieved for MAXi > N - 1, ∀i = 1,..., N . That is, in order for every participant to be active in the same conversation, their maximal waiting time cannot be less than the number of participants minus one (the participant herself). If this requirement is fulfilled, the initial conversation will, on average, be stable - all parties will remain actively involved as time evolves. MAXi > N - 1 for i = 1,..., N - 1 . MAXi < N - 1 for i = N .
Then the last agent is - statistically speaking - doomed to reach latency (and eventually leave the conversation). In order to find the critical values of patience of the other agents, a similar analysis as before can be performed for N' = N - 1 and we can conclude that the conversation will be stable if all the rest of speakers have a patience level such that MAXi = N' - 1 = N - 2 . Applied iteratively, this analysis leads to the limit N = 2 which requires MAXi > 1 - that is, a 2-party turn-taking conversation. This is consistent with our ABM simulations. A straightforward conclusion is the following: the number of parties within a conversation will decrease until everybody feels comfortable (i.e. until the patience thresholds of everybody are above the critical values), and from there, it will remain as a stable conversation that every speaker will profit of. The possible introduction of newcomers into an ongoing conversation renders a direct analytic approach, even in this very basic scenario, more difficult and goes beyond the scope of this work. Furthermore, the analytical developments only provide insight on the steady state, i.e. for conversations of infinite duration. However, as commented above, real-time conversations only develop in finite time. Therefore, to focus on realistic scenarios it is required to study the conversation dynamics within finite time windows, as discussed in the following Section. The baseline model's assumption of simultaneous turn-taking (2) roughly defines the characteristic time unit of the model (1 tick = 1 conversation turn) as well as the empirically-relevant range of the total number of turns taking place during a reasonable table talk. Now, what is the correspondence between computational time steps and actual time? While a time turn can in the real world last even very-few seconds, here we deliberately obviate very-short time turns, since these short turns may not have a relevant influence on the agents happiness. Accordingly, we set a conservative estimation of an average of ten seconds per time step (we remark that, as for the conceptual aim of the present work, this actual value is secundary - still it will nonetheless need to be confirmed with real experiments). A one hour-long conversation then would allow for about 360 turns, which is hereby defined as the actual conversation time window. For what said before, this information may also be used to put a lower bound on the range of permissible maximum levels of happiness. We found that, for even and odd numbers of participants larger than 5, avoidance of convergence to the stationary distribution within the first 360 turns can be achieved by setting the maximum happiness level larger than about 8 - i.e. 8 is the minimum number of conversation turns which needs to be tolerated without being a speaker to avoid precocious conversation convergence. Tables of participants with higher maximum levels of happiness would be able to maintain large conversation groups for longer periods of time. As an example, Figure 3 shows the transient dynamics up to 376 ticks and the final stationary distribution of a model run with 15 participants and a maximum happiness level of 8. The geometric location of, and the very participants involved in a group conversation, tend to be persistent over time. Conversation groups rarely include people who are not direct geometric neighbors of other people in the same conversation. Also, latents can be trapped within a conversation group (see e.g. 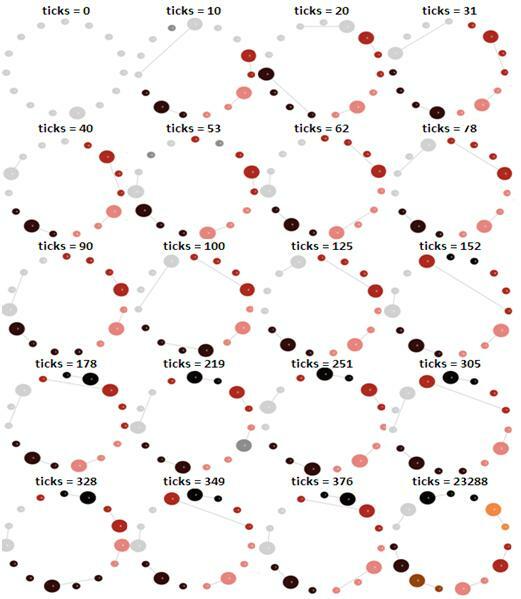 at ticks 10 and 53 in Figure 2). Finally, the typical size of a conversation group mildly fluctuates in the transient timescale, assuming a typical value of 4 parties. Figure 2: Example of transient dynamics for a 15-party conversation with maximum happiness level of 8. Each agent is colored according to his belonging sub-conversation; latents are colored in dark grey. The initial table-wide conversation splits right after the beginning into 4 smaller sub-conversations because the happiness levels of some table members necessarily become simultaneously minimal, and latents can be mutually-close with high probability. After the initial schism (first 10 steps), non-trivial schisming dynamics develops, and agents hop from a sub-conversation to another according to the evolution of their individual happiness status. 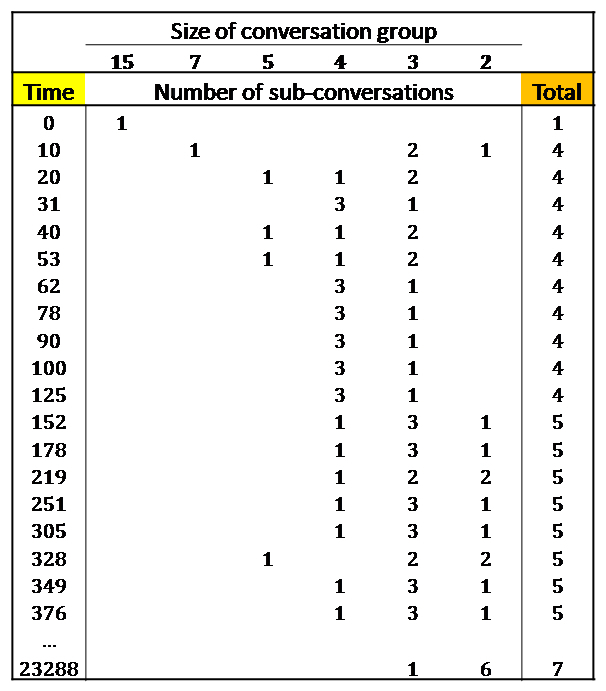 The 4 sub-conversations persist for 150 ticks before another sub-conversation is started. No other conversation group is formed until 376 ticks, i.e. the end of the table conversation. Figure 3: Time evolution of conversational groups for the conversation in Figure 2. All the above findings hold in general and not only in the special illustrated example. Importantly, in spite of abstracting from conversation contents and contexts, many of these findings seem to correspond, at least qualitatively, to phenomena that can be observed in real table conversations. For example: table-wide conversations involving a large number of people are unstable, while smaller conversation groups persist over longer periods of time; people sometimes change conversation groups, and when this happens they confine themselves to nearby conversations (the conversational principle of least effort is the reason why party organizers often pay so much attention to the initial table population and configuration, if it is supposed to remain fixed); people within a conversation group change from time to time, but the conversation group has a tendency to remain in a specific geometric location, and only a limited number of people around the table join a specific conversation group; people who have left a conversation group may eventually return to that same conversation later; sometimes people would like to leave a conversation, but nonetheless they may remain in it because they are trapped between two people eagerly taking turns in that very conversation. The previous analysis support a fundamental conclusion: the nucleation of sub-conversations may be considered a dynamical mechanism that take place in conversation dynamics according to abstract and purely-local rules of happiness evolution, also independently of context- and content-related arguments. A proxy for empirical evidence? To assess the extent to which our model replicates quantitatively real-world table conversation dynamics, one should compare the predicted dynamics to large empirical data sets. While a detailed comparison with controlled dynamical experiments is left for future investigations, we inquired into the ABM predictions for optimal transient size of a conversation group. We performed a preliminary e-mail poll of 105 people (with ages in the range of 20 to 40), asking the pollees to answer to the following question: In your opinion, what is, on average, the maximum number of people that can be involved in the same table conversation before this conversation gets uncomfortable? Notice that the question does not suggest a pre-determined context- or content-related conversation, and is free from any cognitive bias except for the freedom implicitly allowed in the interpretation of an uncomfortable conversation. Figure 4 shows the histogram of the answer's frequency. The maximal value for the size of a stable conversation group (N = 4 ) matches the typical upper bound of conversation group sizes that were reached in our simulations within the actual duration of conversations (see Sec. 3.2) While encouraging, this match does not suffice as empirical evidence for the model; and we could wonder why we should assume that the opinions of the respondents to the survey provide credible evidence. This is statistically straightforward: people's opinion is biased on experience, that is, their opinion is a byproduct of an average over many previous conversations, in many different situations, scenarios, conversation topics, conversation group characteristics, and so forth. The opinion of individuals is therefore a proxy for real behavior. On the one hand, such massive average over contexts and contents holds up with our focus on context-independency; on the other hand, one could argue that each individual is likely to have a different opinion, since each individual is susceptible to have different experiences. Nevertheless, if a common underlying mechanism exists, and if the histogram of individual's opinions has a well defined average, the central limit theorem indicates that the actual average result will tend to such average in the histogram. Further empirical data should be obtained in order to confirm these preliminary results. Figure 4: Histogram of the maximal number of people for a comfortable conversation according to our e-mail survey. The distribution's mode (N = 4 ) agrees fairly-well with the numerical prediction of the baseline model. Large conversation groups are unstable. Within a finite and reasonable time window, we may find stable conversations of more than two people. Schisming develops mainly from a balance between local rules (e.g. happiness of parties) and the global characteristics (e.g. number of participants, eventual criteria of target choice) of the conversation. The formation of new conversation groups is a relatively-rare event after the initial conversation split: the conversation dynamics mainly consists of people joining and leaving already-existing conversation groups, according to non-trivial spatio-temporal patterns. Table conversations rarely involve people who are not geometric nearest neighbors. Participants may remain trapped within their present conversation group, in spite of their dissatisfaction. Dyadic conversation groups are asymptotic absorbing states. The characteristic time needed to reach the stationary state scales exponentially with the maximum level of happiness, and linearly with the number of participants. The focus of the present investigation was on the rather-conservative baseline model of conversation dynamics, that originated as an attempt to demonstrate a context- and content-free schisming mechanism. Further progress in this direction will depend on the matching of simulated and experimental data, which might well entail the refinement of the model assumptions. Agents heterogeneity and memory. The baseline model has one control parameter (the happiness degree) that can be used to fit empirical data; also, all agents are homogenous and follow the same time-independent behavioral rules. It seems obvious, though, that the large heterogeneity and variety of human behavior manifests itself also in conversations. For example, some people in a conversation group can actively try to let people speak who have not spoken for a long time; or, on the contrary, speakers might tend to address only people in their conversation group who have contributed recently. As such behaviors are here modeled by the probability distribution that determines the next speaker, it is natural to allow for speaker-dependent and time-dependent probability distributions, as well as for updates of the same distributions to encode memory effects. Asynchronous updating. Inclusion of the current speaker in the probability function that determines the speaker of the next turn. This eliminates the table-wide simultaneity of turn taking, and allows a different interpretation of the characteristic time to stationarity of the system. It also removes the stability of 2-people conversations, and makes the stationary states potentially more interesting - if one further assumes that 1-person conversation group cannot socially exist, and lonely people have to join other conversation groups instead. Dynamical neighborhood topologies: Modify the conversation geometry so that parties can form conversation groups with more than only two neighbors; any number of neighbors becomes possible (reminding of e.g. the connectivity of brain networks). A dynamic topology might eventually reproduce cocktail party dynamics. On a more abstract level, our model describes the dynamics of interacting sub-networks where the interaction derives from random walks taking place on these sub-networks. It would be interesting to define fixed sub-networks and allow linkage of two different sub-networks (i.e. let the random walk take place on the linked sub-networks) whenever one node in a sub-network reaches a properly-defined critical state and joins another sub-network. These generalizations might prove useful to model phenomena like volatility surges during financial crises, background noise of brain activity, split and re-composition of existing communities if regular interaction or communication is absent, or validation frameworks for smart rooms algorithms - to cite but a few. The authors would like to acknowledge the great hospitality and support of the Santa Fe Institute during the Complex Systems Summer School '09, funded by the SFI and the National Science Foundation. Special thanks go to Dan Rockmore and Tom Carter. The authors also thank Jordi Luque and Andrea Firrincieli for fruitful discussions. LL acknowledges financial support from Spanish grant FIS2009-13690. Finally, the authors would like to thank Chuck Brown for being a perpetual source of inspiration and funk. All codes as well as their NetLogo implementations utilized in and derived from this work are freely available under request. AOKI, P. M., SZYMANSKI, M. H., PLURKOWSKI, L., THORNTON, J. D., WOODRUFF, A. & YI, W. (2006). Where's the "party" in "multi-party"? : analyzing the structure of small-group sociable talk. In: Proc. 20th Anniversary Conference on Computer Supported Cooperative Work. AXELROD, R. (2006b). The evolution of cooperation. Basic Books. BONO, M., SUZUKI, N. & KATAGIRI, Y. (2003). An analysis of participation structure in conversation based on interaction corpus of ubiquitous sensor data. In: Proc. INTERACT 2003. IOS Press. BYRNE, D. (1998). Complexity theory and the social sciences: An introduction. Routledge. GOFFMAN, E. (1963). Behavior in public places. Notes on the social organization of gatherings. Free Press. GOODWIN, C. (1984). Notes on story structure and the organization of participation. In: Structures of social action (ATKINSON, J. & HERITAGE, J., eds.). Cambridge University Press. MILLER, J. H. & PAGE, S. E. (2007). Complex adaptive systems: An Introduction to Computational Models of Social Life. Princeton University Press. SCHEGLOFF, E. A. (1995). 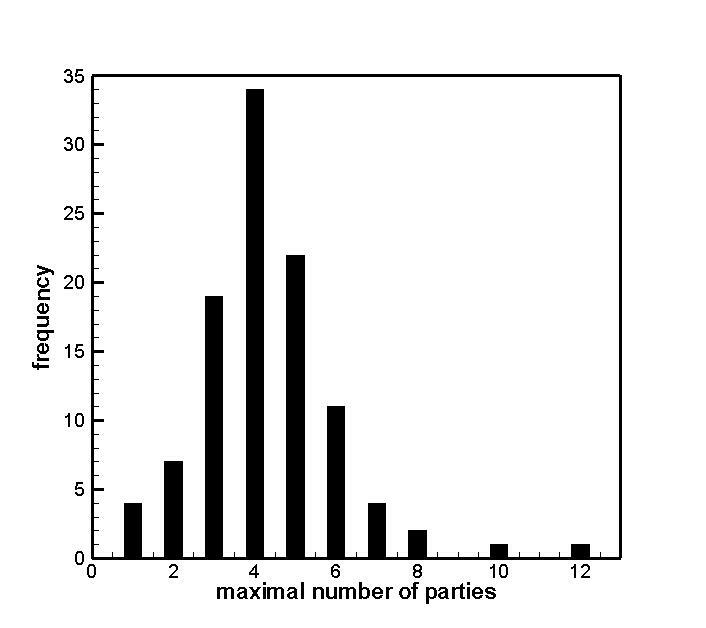 Parties and talking together: two ways in which numbers are significant for talk-in-interaction. In: Situated order: studies in the social organization of talk and embodied activities (P.TENHAVE & PSATHAS, G., eds.). University Press of America, pp. 31-42. SCHWEITZER, F. (2003). Browinian agents and active particles. Springer. STIEFEKHAGEN, R., YANG, J. & WAIBEL, A. (2002). Modeling focus of attention for meeting indexing based on multiple cues. IEEE Trans. Neural Networks 13, 928-938.